According to the 2016 World Green Building Trends MarketWatch report, 43 percent of architects surveyed in the United States report they will be doing green retrofits in the next three years. And the U.S. is not alone in this trend – the global average is 37 percent as well. Based on this data, retrofits are clearly a strong focus in North America as well as the rest of the world. Even Mexico and Canada reported similar percentages for performing green retrofits in the next three years. And, the statistics do not lie! Green buildings consume far less energy compared to the average commercial building. According to recent research, the percentage of carbon dioxide emissions avoidance attributed to LEED buildings is estimated to be 4.92 percent by 2030. With results like this, current market trends suggest that building owners and managers will invest approximately $960 billion by 2023 on greening their existing built infrastructure. As opportunities in the green building retrofit market continue to arise, we cannot help but notice how building owners and developers are placing a greater emphasis on reassessing their current buildings and making updates in order to improve energy efficiency. Electrochromic glass is a great product for retrofits due to its ability to reduce reliance on energy-intensive HVAC systems as well as overhead electrical lighting. Furthermore, the product is easy to install, while allowing building occupants to maintain a connection to the outdoors and improving the overall indoor experience, as demonstrated by our retrofit at The Kimmel Center in Philadelphia. 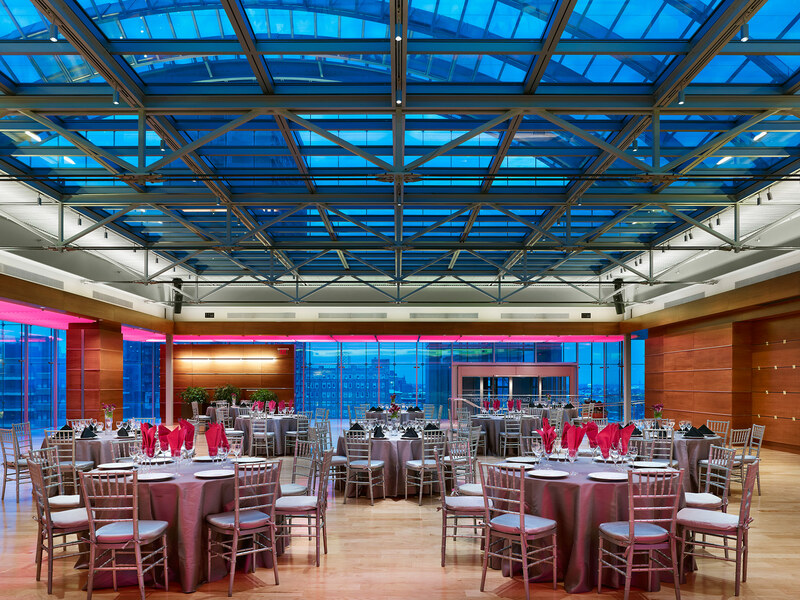 Before the installation of SageGlass, The Kimmel Center’s Dorrance H. Hamilton Garden Terrace, enclosed inside a 150-foot-high barrel-vaulted glass roof, suffered from monumental solar control challenges. These issues sent indoor temperatures climbing to 100 degrees or more, creating an uninhabitable space. By installing 2,100 square feet of our dynamic glass on top of the interior terrace, the Terrace has been transformed into an elegant glass and steel structure that controls noise, enhances occupant comfort, and offers iconic views of the city. Our electrochromic glass reduces heat gain and glare without obstructing the space’s breathtaking views, which has turned this nearly uninhabitable terrace into a comfortable gathering space. The Hamilton Garden Terrace is now functioning as originally intended as a spectacular venue for social events and wedding receptions. Because the majority of buildings already exist, and new construction is a small percentage of the market, it is important to consider the opportunities that retrofit projects present for the electrochromic glass industry. Retrofits using electrochromic glass also positively impact the environment by allowing for less reliance on energy-intensive HVAC systems and overhead electric lighting. Although façade retrofits may be considered expensive, in the long-run, theses installations offer a significant return on investment as well as increase overall occupant comfort, which can have additional positive implications.